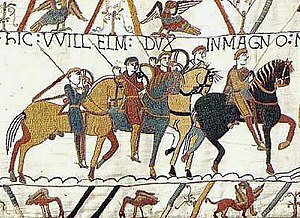 William was Duke of Normandy, a country on the other side of the English Channel, now a region in France. He invaded England after the death of King Edward the Confessor because he believed he had the most right to be King of England. But King Harold II had himself crowned king instead. King Harold, with his Saxon army, and Duke William fought at the Battle of Hastings on October 14, 1066. King Harold was killed in the battle and his army left. On December 25, 1066 William was crowned the new King of England. England has never been successfully invaded since the Norman invasion nearly 1000 years ago. Essential Norman Conquest, multimedia resources by Osprey Publishing. This page was last changed on 15 March 2019, at 00:56.